You may think travel is one of the most effective and active methods of study. And if you are looking for Great Outdoors with which your children can have fun but surprise to learn new things around the world, this tour is tailored for your family as a best holiday. 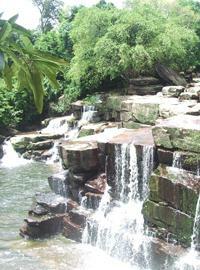 Not only possessing one of the world heritage sites but Cambodia is a living classroom which reveals much more. Upon arrival at Phnom Penh airport, meet and transfer to hotel. Visit the Victory Monument and the National Museum, the Royal Palace, built by the French in 1866 on the site of the old town, and Silver Pagoda, which located within the Royal Palace ground. You will then end your tour with a visit to Wat Phnom Temple, Phnom Penh's namesake, from where you can enjoy views over the tree lined avenues of the city during sunset. Accommodation at hotel in Phnom Penh. Breakfast at hotel. Visit the Tuol Sleng Genocide Museum. This former school was used as a prison by Pol Pot’s security forces. If became the largest centre for detention and torture during the rule of the Khmer Rouge. Then time at leisure at Russian market and the Killing Fields of Choeung Ek. Take a walk along the Mekong River and boarding the boat for Mekong Sunset Cruise (1 hour). Accommodation at hotel. Morning private transfer with accompanying guide for overland excursion to Sihanoukville. It takes about three and half hour to the quiet nice beach at Sihanuke Ville. Upon arrival, check in at the hotel and free at leisure for swimming and relaxation on beach. Overnight Sihanoukville. Free at leisure at the nice beach or wander around on your own. Overnight Sihanoukville. Trip to Bamboo Island by passing a few difference islands to enjoy with snorkeling and swimming at the nice beach of Bamboo Island. A great fish barbecue on the beach. Check-out from the hotel, then private excursion transfer with accompanying guide to visit Water Fall Kbal-Chhay until transfer back to hotel at Phnom Penh. Overnight in Phnom Penh. Morning transfer for flight to Siem Reap. Upon arrival met and transfer to the hotel. In the afternoon, Visit the Cambodia Cultural Village, which comprises various traditional shows and exhibitions. There is also traditional Apsara dancing and miniatures of all the famous historical buildings. Evening at leisure and you can enjoy hotel facilities. Accommodation at hotel in Siem Reap. Visit the Roluos Group. The monuments of Roluos, which served as the capital of Indravarman I (reigned from A.D 877-89), are among the earliest permanent temples built by the Khmers and mark the beginning of Khmer classical art. See the temples of Preah Ko (erected by Indravarman I in the late 9th century and dedicated by the King to his ancestors), Bakong (the largest and most interesting of the Roluos group temples, it has an active Buddisht monastery) and Lolei (built on an islet in the center of a large reservoir by Yasovarman I, the founder of the first city at Angkor). Return to the hotel for your lunch (not included in the package). In the afternoon, you will continue your temple visits. Included are Prasat Kravan (with its unique brick sculptures), Srah Srang ("The Royal Boths" was once used for ritual bathing), Banteay Kdei (surrounded by four concentric walls), Eastern Mebon (guarded at its corner by stone figures of harnessed elephants, some of which are still in a reasonable state of preservation) and the "Mountain Temple" of Pre Rup until sunset. Visit the ancient capital of Angkor Thom (12th century). See the South Gate (with its huge statues depicting the churning of the ocean of milk), Bayon Temple (unique for its 54 towers decorated with over 200 smiling faces of Avolokitesvara), the Royal Enclosure, Phimeanakas, the Elephant Terrace and the Terrace of the Leper King. In the afternoon, visit the most famous of all the temples on the Angkor plain: Angkor Wat. The temple complex cover 81 hectares and is comparable in size to the Imperial Palace in Beijing. Its distinctive five towers are emblazoned on the Cambodian flag and the 12th century masterpiece is considered by art historians to be the prime example of classical Khmer art and architecture. Angkor Wat's five tower symbolize Meru's five peaks, the enclosed wall represents the mountains at the edge of the world and the surrounding moat symbolizes the ocean beyond. At 7.30 am, embark to visit the largest community on the Tonle Sap Lake at Kampong Khleang. Depending on the time of year and lake water levels, we will approach Kampong Khleang by road or boat. Stroll through this undeveloped community, visiting local traders and the pagoda. Then it's time to take our places on our own motor-boat to cruise along the estuary, passing unique tall stilt-houses and then onto the Tonle Sap Lake. Here we will see a whole floating village - including houses, a floating fish market and even a floating school. Back to Siem Reap, free time until transfer to Siem Reap International Airport for the departure flight. End of services by Indochina Travel Service. This tour is organized for individual travellers and can be customized upon request.